The following samples (MFC/Visual C++ samples) illustrate the most significant functionality of the Prof-UIS library. Each sample features dynamic switching between standard GUI themes provided by Prof-UIS: Office 2007/2003/XP/2000 and Visual Studio 2005. The ThemeColorizer application includes a set of predefined themes (Luna Blue, Luna Olive, Visual Studio 2005 and more) and also allows you to create the theme that most closely matches your tastes. The sample binaries packed in zip-files can be downloaded from the current page. Their source code is freely available in Prof-UIS Freeware or Prof-UIS Trial from the Download section. Demonstrates the features of the formula grid control (CExtFormulaGridWnd) like on-the-fly formula evaluation, syntax highlighting formula editor with an auto complete popup list box, highlighted and editable cell ranges, rich tool tips, named ranges and a sparse data provider. The sample also demonstrates the features available in both the generic grid control (CExtGridWnd) and formula grid control (CExtFormulaGridWnd): standard copy, cut, paste commands compatible with Microsoft Excel, Open Office Calc and text editors, delete selection and clear formatting for any cell ranges, OLE drag-and-drop between processes, import from/export to Microsoft Excel, grid cell styling (fonts and colors) and more. Demonstrates the geographic longitude and latitude input controls (CExtLLEditWnd and CExtLLMapWnd) with on-the-fly customizable options and behavior. Demonstrates how you can synchronize data between a data grid (CExtGridWnd) with joined cells and a property grid (CExtPropertyGridWnd). Illustrates how easily you can add sorting and filtering capabilities to your data grid, tree grid or report grid. The functionality is provided by the CExtGridCellHeaderFilter class, which represents a header cell with a filtering drop-down menu. The menu allows the user to sort columns alphabetically and reverse alphabetically and filter the content using text and value filters. Additional features include automatic serialization of sorting and filtering settings and applying filtering on the fly when editing settings in the drop-down menu. Demonstrates a zoom scroll bar window similar to that introduced in Microsoft Office 2007/2010 applications. A map of railway stations in Germany is drawn in the scrollable window and you can use the scroll bar to zoom the map in and out. The sample also shows how an alpha-channel bitmap can be used for highlighting the zoom area selected by left-clicking, holding, and moving the mouse. Illustrates the ribbon bar introduced in beta versions of Microsoft Office 2007/2010. The ribbon bar is consistent with all nine themes available in Prof-UIS. Demonstrates how to use the ribbon page control independently from the ribbon bar. You can to put different ribbon groups onto the ribbon page and see how the layout of buttons changes when the application window is resized. The main idea of this sample is to show that you have full programmable control over the ribbon bar' layout. 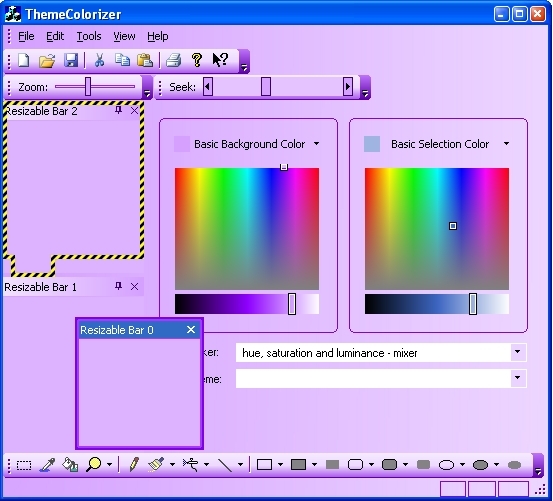 Illustrates the primary controls including toolbars and the menu bar in the dialog window, user-defined toolbar buttons, pop-up menus with owner-draw items and left area, menu animation effects, the powerful color picker menu and dialog, status bar control, tab window and tab containers. NEW Added a number of new pages: List View, Tree View, Masked Edit, Shell List View, Shell Tree View, Shell Browser, File Dialog and Browse for Folder Dialog. Demonstrates key features of the Prof-UIS report grid including Outlook-like row grouping, auto preview for text and graphics, automatic column sizing, UI persistence, various modes of row selection, row/cell focus, column and row formatting, a set of modes of displaying cell buttons (always, in the focused row only, in selected rows, and never), disabled sorting and grouping for particular columns, read-only mode, editable mode with immediate grouping and sorting according to the changes made, Outlook XP and Outlook 2003 report grid layouts and styles. The report grid is populated with data (1764 rows and 26 columns) from the Microsoft's AdventureWorks sample database. Shows how to use icons of different sizes and different color depths in toolbars. It also demonstrates how, for the toolbar buttons, to change the font, font size and font style of the caption as well as the button image on-the-fly. NEW Vista icons (RGB/A 32-bit icons with alpha channel) in menus and toolbars (works on any Windows OS starting from 95/NT). Demonstrates the skinning capabilities including alpha blending in controls and custom window borders and captions. The implemented skinning architecture is based on an XML file that describes the hierarchy of GUI elements and how they are painted. The PNG (Portable Network Graphics) format used for all images makes it possible to support alpha blending for all Windows OSes starting from Windows 95 / NT 4.0. The current version features the Black Diamond (299 PNG images) and Aqua (277 PNG images) skins with other skins coming soon. Shows how to implement an extendable set of commands in a customizable application based on a set of plug-in DLL modules. At application startup, a simple plug-in manager automatically scans the application folder for DLL modules implemented as plugins and initializes menu/toolbar commands for them. The 12 plug-in DLL modules perform simple image processing tasks such as pixel transformation, color correction, and applying effects. Shows a simple way of assigning text to toolbar buttons and/or menu items using the Active Script engine. It also demonstrates a user-defined interface for reading the content of edit fields in the main view window. It is a simplified version of the ActiveScripts sample. Demonstrates new features of the Prof-UIS property grid control including compound properties and new grid cell types for editing attributes of fonts, colors and rectangles. The compound property can contain a number of nested properties and any nested item in its turn can be a compound property. Any sub property is reset independently from the parent property. These features coupled with the capability to display and edit properties of several objects simultaneously allows you to easily and quickly manage objects of any complexity. A set of other controls in the main window allows you to customize the property grid control's appearance. Demonstrates a NEW tabbed tool control bars. The new class features switching the tab control position on-the-fly, both for all tabbed toolbars and resizable control bars inside dynamic tabbed bar containers; using docking algorithms for resizable control bars regardless of the currently applied GUI theme; custom-drawn captions and separators for resizable control bars; on-the-fly rendering a custom background for the entire application (a hurricane background). The main view window is implemented as a One Note tab page container window with colored tabs and tab pages allowing you to configure the demonstrated features. Illustrates some important features of Prof-UIS including on-the-fly changeable Microsoft Visual Studio 2005 and Office 2000/XP/2003 themes, Microsoft Visual Studio 2005-like resizable control bars and docking markers, powerful tab interface, autohide feature, and detachable tab windows. It also demonstrates the work of a "persistent affixment algorithm" and shows how user-defined popup menus can be tracked over different frame areas (docking bars, floating mini-frame captions, toolbar content expand buttons, dynamic tab container areas, and grouped autohide tabs). NEW Prof-UIS now supports the visual styles available in all releases of Visual Studio 2005: Beta 1, Beta 2, and Final Release. Demonstrates the features of the Page Navigator control that looks like and has similar features to the Microsoft Outlook 2003 Navigation Pane. NEW With the Options Dialog you can now modify the order and visibility of the navigation items. You can also serialize the number of expanded items as well as their visibility and order to the Windows registry. Shows how to use some features of the Visual Studio .NET/2005-like property grid control for setting up and browsing properties of custom-drawn buttons. The properties of different types can be configured separately or in groups and can be viewed in categorized and sorted grids. Each property is implemented as a grid cell of the appropriate type with its own specific cell button and drop-down window. Demonstrates how the Resource Manager component can help you implement on-the-fly switching between the languages supported in Prof-UIS and your application. The internalization support is implemented in Prof-UIS in such a way so it does not require you to deliver a bunch of language-dependant dll files to the users of your application. NEW Right-to-left (RTL) layout support. Demonstrates how a new component Dynamic Bar Site (CExtDynamicBarSite) can be used for controlling the docking behavior of your resizable control bars, which now support the following states: floating only, docked as a document in the MDI client area with/without the MDI tab control, docked as the main view window in an SDI application, and docked to any inner side of the frame window or to another control bar. The sample also illustrates a new "Options" menu for control bars, with which you control the control bar states. New experimental application shows how to display pop-up rich text views next to menu items and toolbar buttons. This feature can be used for implementing a tutorial mode in your applications. The sample demonstrates several tricky MFC/Prof-UIS techniques like using view windows with the WS_POPUP style, dynamically allocated MFC documents and document templates, and handling Prof-UIS helper messages for keeping track of currently selected or covered by the mouse pointer command item in a menu/toolbar. Illustrates how the Prof-UIS image editor window can be used as a bitmap editor for bmp files or bmp application resources. The sample also demonstrates how to use the Prof-UIS color palette window for displaying all colors used in the bmp image as well as for selecting the current color in the editor. It also shows how to implement customizable toolbars and menus for SDI applications. Demonstrates how to use the Prof-UIS toolbox window and implement OLE drag-and-drop between windows (toolbox, customize dialog and scrollable view). The toolbox control can be configured in a way that it will look and behave absolutely like in Visual Studio 2005 and Visual Studio .NET 2002/2003. Also illustrates how to use the content pop-up window for displaying the full contents of a partially visible item. This non-rectangular window can also be used for highlighting the current screen position of a particular item with special arrow marks, which also demonstrated in FormEditor. These red arrow marks appear when you are dragging a tool item to its new position. Finally, the sample shows how easy is to implement a ruler control bar. Shows how to customize the Office 2003 theme with user-defined colors. By setting the desired basic background and selection colors, you can change the overall appearance of your application regardless which OS you run. ThemeColorizer also demonstrates a custom docking outline for the resizable control bars being dragged or resized. Demonstrates basic features of the Prof-UIS Automation Pack designed to add OLE Automation support to your Prof-UIS-based customizable applications. This will allow your users to use script languages like VBScript to customize the user interface and modify the application default behavior. For example, your users could easily add some named commands, associate them with new controls in the menu or/and toolbars, and assign appropriate event handlers. Shows how to use the ADO recordset object in conjunction with the Prof-UIS grid control. The sample allows you to configure a database connection, perform an SQL query, select the static or virtual (keyset) cursor type and browse results in the grid window. The Prof-UIS grid features "external" scroll bar controls, which may be inserted into it, rather than displaying its own "inner" scroll bar-like areas. This enables you to insert any controls next to the scroll bars, which is also demonstrated in the sample. Demonstrates the basic features of the grid control introduced in Prof-UIS 2.24: hover highlighting, selection, scrolling, sorting, drag-n-drop operations, cell types, automatic data alignment and more. The sample is implemented as ten grids inserted into a flat tab container window. Shows how to work with the toolbar slider button. The slider features optional scroll arrow buttons like those in the standard scroll bar. The Zoom and Seek slider buttons represented in the sample demonstrate how to control the playing of AVI files. With the Customize dialog, you can also create clones from a certain slider button and watch how these sliders work synchronously. Demonstrates the status bar control, which is an enhanced version of the standard MFC status bar. It features "friendliness" to controls of almost any kind, which can be easily inserted/removed into/from its panes on-the-fly, displaying status tips in any of its panes, better consistency with the Prof-UIS themes in comparison with the standard control, and flicker-free rendering. Illustrates how to use the feature-rich flat tab control with which you may create tabs that look like the sheet tabs in Microsoft Excel or the Output pane tabs in Microsoft Visual Studio 6. Or you may give your tabs any customized look and feel. The flat tab container and its associated tab control can be inserted into any window including MDI/SDI views and control bars (as it is shown in the sample). You can easily place trees, lists, edits, dialogs, and whatever you like onto the pages of the tab container. This allows you to present data to your users in a handy and efficient way. Demonstrates customizable keyboard accelerators, the Options page for the Customize form, consistent resizable combo fields in toolbars and menus, and the Add/Remove Buttons menu available for each toolbar. Demonstrates how to use the Prof-UIS icon editor dialog for editing images of different sizes and different color depths. Demonstrates how to output rendered images (OpenGL animation) both to the main view and to the dockable views resided in resizable control bars. This multithreaded application allows you to select an active camera in each view, set up its parameters and perform 6 DOF simulation of camera maneuvers. GLViews also illustrates playing an AVI file on a 3D surface, OpenGL stencil buffer-based reflection, and frame image rendering during animation. This sample application based on the Microsoft's sample with OLE Server-Container technology support illustrates the use of OLE-verb menus, OLE Client-Server compatible control bars, color picker menus both in menu bar and in toolbar, toolbar buttons with dynamically generated icons, owner-draw menu, and more. Demonstrates how to implement different kinds of bars with fixed size including dialog bars, palette bars, custom-drawn panels. Shows multithreaded output to rich edit controls placed in resizable control bars and MDI child frames. Demonstrates how to use CExtResizablePropertySheet as a child window of the resizable control bar and MDI child frame. Demonstrates how to use both the page container window and the shortcut list control with on-the-fly changeable styles. Demonstrates how to load/save the UI state from/into a disk file. Illustrates the usage of the resizable property sheet window as an application's main window. Demonstrates how to use control bars both in the MDI frame window and in the MDI child window. Illustrates full state persistence of control bars when switching between windowed and full screen modes.